Pittsburgh Steelers running back DeAngelo Williams arrives at Heinz Field to play the Baltimore Ravens. 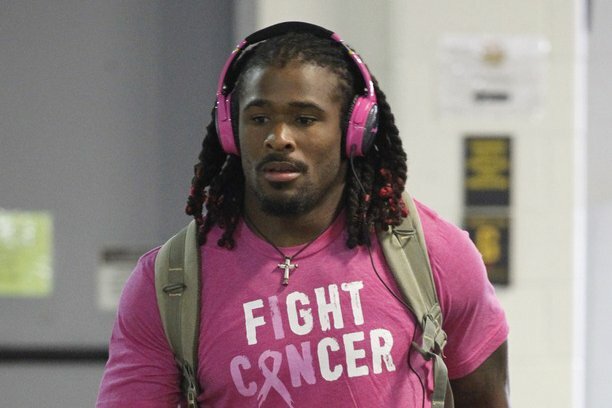 Pittsburgh Steelers players DeAngelo Williams and Cameron Heyward both expressed disappointment this week after the NFL, citing its uniform policy, denied their attempts to raise cancer awareness on the field. Williams told ESPN Monday that NFL Vice President of Football Operations Troy Vincent told him over the phone that he couldn't wear pink accessories after breast cancer awareness month in October. Vincent said there are no exceptions to the uniform policy. Williams lost his mother, Sandra Hill, to breast cancer in May 2014. To honor her, he dyed the tips of his hair pink. Since he can't wear the pink shoes or pink wristbands throughout the season, Williams said he is purchasing 53 mammogram tests in honor of his mother's age when she died. The tests will be done at a hospital in Charlotte, North Carolina, where he played nine NFL seasons for the Carolina Panthers, and in Pittsburgh, ESPN reports. "It's not just about October for me; it's not just a month, it's a lifestyle," Williams told ESPN's Lisa Salters during the Monday night broadcast. "It's about getting women to recognize to get tested." Like Williams, Heyward was disappointed with the NFL's policy this week when he was fined more than $5,000 for wearing eye black honoring his father during the team's game against the San Diego Chargers Monday night. Heyward's father, former NFL fullback Craig "Ironhead" Heyward, battled cancer and died in May 2006. In his honor, the Steelers defensive end wore the words "Iron" and "Head" under his eyes. The gesture resulted in a $5,787 fine, ESPN reports. Heyward said he will try to appeal the violation. "There are a lot of other things we could be worried about," Heyward told ESPN. "Guys want to do right by the league. They don't want to upset anybody. I do it to honor somebody, DeAngelo does it to honor somebody, it shouldn't be taken to offense by anybody. We're not trying to gain publicity by it. We grew up in this game loving it. To be a part of it is a blessing, but I want to honor [my dad]." Heyward said he has worn the "Ironhead" eye black before, but this is the first time he received a fine for doing so.